The Orang Utan Republik Foundation (OURF) will be holding its annual fundraising event on Sunday, October 19, 2014 (4-7pm). The theme this year is, "Raising Funds, Raising Hope." The idea is that by raising funds for OURF's conservation education programs, there is continued hope to save orangutans in Indonesia. 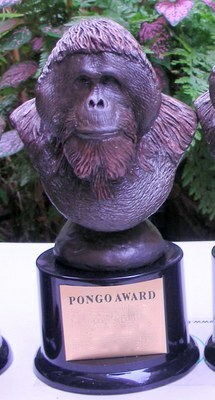 The OURF awards committee will be honoring a number of individuals, some celebrities, with the distinguished Pongo Awards for their contribution "to the improved understanding and appreciation of orangutans and endangered species, rainforest habitat, and for improving conditions for orangutans and other animals". Climate scientist Michael E. Mann will be one of the recipients of the Pongo Award this year for his research that provided important global temperature data and a strong case for global warming.